Chancellor of City and Lord Mayor of London, Alderman the Lord Mountevans, hosted this year’s Chancellor’s Dinner at his official residence, Mansion House. The annual event gives City the chance to share news and achievements with supporters, alongside developing new relationships with individuals and organisations. More than 200 people attended the black tie event held on Wednesday 20th April. The guests included students, staff and supporters of City, along with members of the University of London, including the Chancellor, HRH the Princess Royal and Vice-Chancellor, Professor Sir Adrian Smith. 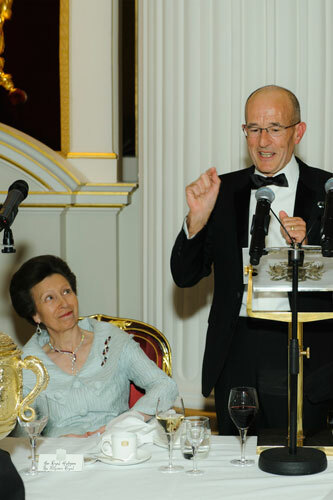 This year’s dinner was the final occasion when the event will be referred to as the “Chancellor’s Dinner", as in future, the Lord Mayor will be “Rector of City, University of London”. HRH the Princess Royal will become the Chancellor of City when the institution joins the University of London federation later this year. In her speech, HRH the Princess Royal welcomed City to the University of London, adding that the institution will bring “great benefits” to the federation. "Bringing together City, with its special strengths in Business and the Professions and its rich connections with the City of London, with the University of London and its world class institutions is a very positive step forward." The Princess also acknowledged the Lord Mayor and his predecessors, for the time and energy they have devoted to championing the cause of higher education in London. Professor Sir Paul Curran, Vice-Chancellor delivered a speech, touching on the history of City and noting that 2016 is a significant year in the University’s history. Notable landmarks to occur this year, alongside joining the University of London, include the anniversary of City receiving the Royal Charter and the launch of the Vision and Strategy 2026. Sir Paul also thanked the prestigious guests for their attendance and contributions to the University. “The evening is marked, uniquely by the presence of two Chancellors” he said. Alderman, The Lord Mountevans, Lord Mayor of London and the fiftieth Chancellor of City University London and Her Royal Highness, The Princess Royal and tenth Chancellor of the University of London. The baton will pass imperceptibly between them during the summer when Her Majesty the Queen fixes the Royal Seal to our new charter and we become City, University of London. Joining the University of London, Sir Paul said, will help London to realise its “tremendous potential strength” as a centre for education. Nick Behn, the Student Speaker at the event, was one of the first recipients of a PhD scholarship from The Worshipful Company of Saddlers to study Language and Communication Science. Nick told guests during his speech that the scholarship gave him the opportunity to do research that will make a real difference to the world. Nick said he thought City is “more than just a University”. While I stand here telling my story, I realise I am but one student at City who does creative, innovative research, driven by a desire to help others. In my opinion, and what I have learnt on countless occasions in the last three years, is that what makes City great is the people. The people employed to inspire, enthuse and encourage people like myself to do something truly remarkable. Chancellor’s Dinner is the flagship event of the University year and is a spectacular way to say thank you to those who support City with their time and generosity. We are so fortunate to have this opportunity and those guests who attend cannot fail to be impressed by an event that truly exemplifies our relationship with the City of London. David also thanked the team who put in an “immense amount of work” to plan the dinner, including Lindsey Baker, Mark Perry and Neill Walsh in the Events Team.